Syndicate R&D has excellent news! A powerful new Item is now available from the Bank! This brand new Item – “Offense and Defense +50%” - will temporarily improve the Offensive and Defensive statistics of your Units, transforming your army from a bunch of ragtag mercenaries to the finest force Zandia has ever seen! If you feel your Units lack the edge to succeed against the might of ZHG, this Item may be just what you are looking for! Use Offense and Defense +50% to temporarily improve the combat statistics of ALL your Units! Please bear in mind that the Item’s effects cannot be extended – should you wish to benefit from enhanced Unit power for longer, another “Offense and Defense +50%” must be applied! Take note: You cannot apply Offense and Defense + 50% simultaneously with an Offense or Defense Enhancer! 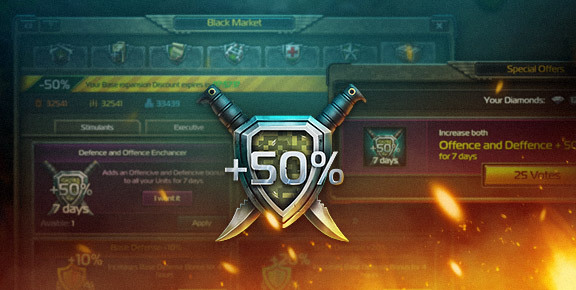 Take advantage of these offers now to strengthen your army and dominate Zandia!